Reading through this entry tonight is like deja vu. Different situation, same story. Advocating for what is best for our girl. If you are new here, while we were in the NICU, John would post updates about our journey on our private Facebook page. 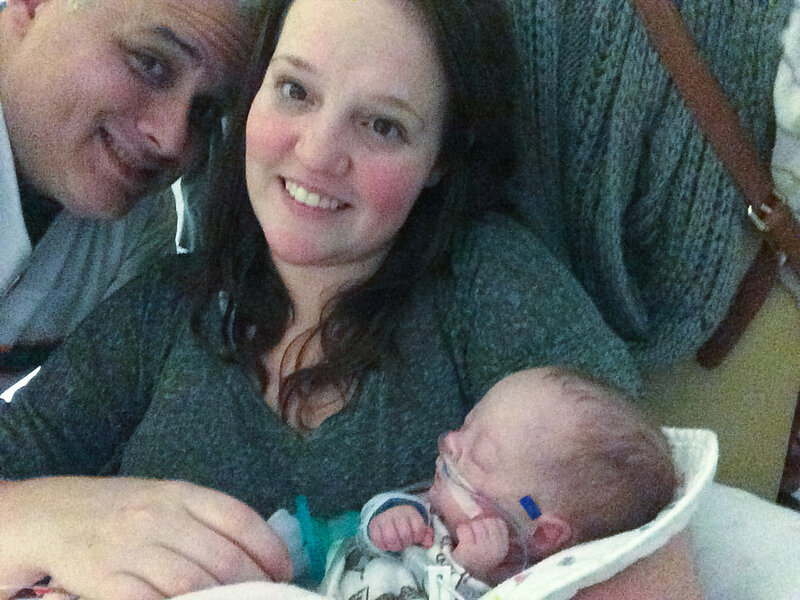 Every few weeks, I will be sharing excerpts from his diary... Diary of a NICU Dad. When we woke up this morning, we weren't quite sure how the day was going to play out. Last night ended badly, but we thought it better positioned us for answers today. She threw up her evening feed and hadn't been having regular stools. We knew this would happen. After being NPO for 4 days with 2x daily enemas and a study of both her upper and lower GI tract, she'd been thoroughly emptied. That was the goal. Her belly had gotten so full that it caused her to stop breathing on Thanksgiving and it put her back on oxygen support. Her lungs were so compressed that it made it hard to breathe. After weeks of these up and down cycles, filling up to the point of not being able to keep down her feeds, it was time to do something more extreme. We were happy that the doctors focused this time on getting her back to baseline. Starting from scratch. From a clean digestive system. Then let's see what she did. We both expected her to fill up again. The neonatologists and the nurses expected it. But we didn't expect it to happen so quickly. Her previous trend was a few days NPO and 7-10 days to fill back up. This time it took 2 days of full feeds. As we left last night, they made her NPO again and we prepped for the discussion with the surgeons. They'd said that if she filled up again, they'd need to go in and see what was happening. So we left the NICU last night, equal parts terrified and hopeful that she'd be going under the knife today. Much to our frustration, when we called this morning for an update before heading in, they told us that the surgical team had come to evaluate her and said that she 'didn't have a surgical belly' and that they'd only be doing a biopsy of her colon to test Hirschsprung's. They take small sections of the colon and send them off to Hopkins to have a pathologist look for the expected nerve cells. If they weren't there, she had Hirschsprung's. The problem with this...the two problems actually...were that it would take 4-5 days to get the results and none of the doctors thought it presented like Hirschsprung's. Until her gut injury, she'd had no issues with digestion. She was regular. Milk in, poop out. Babies with Hirschsprung's usually don't do this. They're usually not preemies. It usually presents in the first 48 hours of life. But they were going to do it anyway. Before surgery. We couldn't understand why. 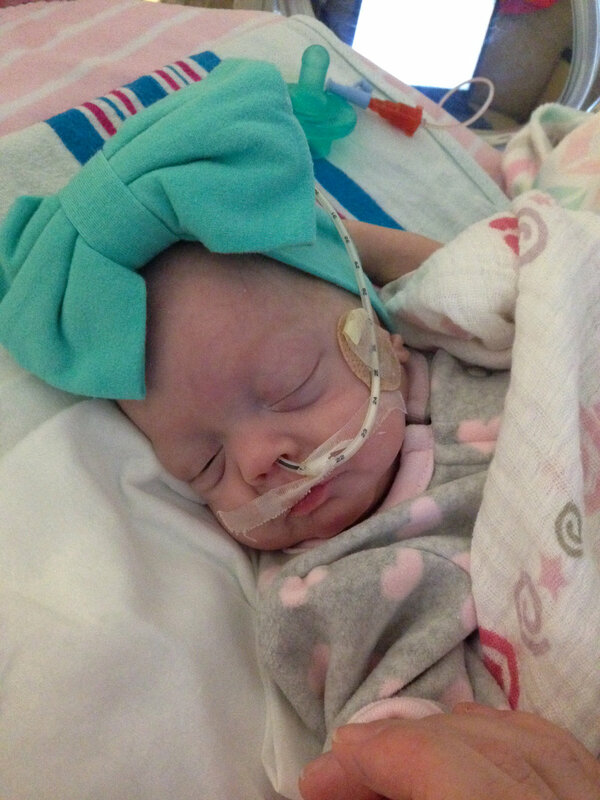 After we hung up with the NICU, I went into a tirade. Pacing around the house, screaming my frustrations to anyone that could hear. I was determined to give the doctors and the surgeons a piece of my mind. Steph and I were both confident that she'd had some injury after the TRAGI that was causing issues with her bowels. We were frustrated that we were told that we needed to wait for her to blow up again before we did something, and she did just that. So why were we continuing to wait? Why did we have to fill our daughter up so much that she was in pain. Grunting and groaning because she couldn't do what nature wanted her to do. Struggling to do something most of us take for granted. Pooping. I've been a bit obsessed with poop and maybe it was a crappy foreshadowing of things to come. We didn't want to see her throwing up, struggling, weak from trying so hard. We didn't want another round of days of NPO, watching her cry angrily because she just...wanted...food. We were tired of it. And so was she. So tired that when we got to the NICU, we could tell she was feeling terrible. She was a pale, grey, blotchy color. She was tired, barely opening her eyes. We knew she was sick. Her CBC came back normal. No issues. Crit was good. White blood cells great. Glucose, perfect. No clinical signs of any other problems, other than being severely backed up. Rounds were finishing just as we arrived and we both spent the time before the doctor came over, ranting to Addie's nurse and the social worker. We wanted an answer. A solution. Feeding for a few days, then stopping to empty her out wasn't sustainable. We couldn't go home like this. The last milestone for her to leave the NICU is PO feeding. Taking a bottle or a breast. The night before, we tried to get her to nuzzle for the first time. She was too tired to try. Too worn out from her struggles to even give it a go. This wasn't going to get her past that hump and home. When the doctor finally came over, I didn't let her talk much. She told me that the surgeons didn't think it was emergent. That they didn't see a child with a surgical belly. I asked, at what point do we stop saying that this, single instance of her belly distention might not be surgical, but the trend of 5 straight incidents was? She didn't have an answer for me. I asked her why they wanted her to blow up, but then we stopped her feeds the night before? We weren't all on the same page. Either blow her up and go in, or give us another option. I asked why we were testing for Hirschsprung's when no one in that room or the University of Maryland Medical Center thought it was even a remote possibility that she had it? I asked her how much longer we were going to have to watch her struggle and be uncomfortable before we did something? She agreed. Her nurse agreed. We decided that we were going to sit down with the surgeon and air these grievances and ask them for a real answer. Ask them for a real plan. One that didn't involve making Addie suffer. Or if it did, one that would have a clear catalyst for when we'd take action. While we sat and held her, watching the hands on the clock make their rounds, the doctor came back and said she'd spoken to the surgeon. That she made our concerns clear to him. That we were done with the guess work. That it was time to do something. She said he'd come back and we'd talk. When he came in, it was clear she'd made an impression on him. He didn't argue. He didn't fight it. He told us that he understood. That he got why we wanted to move forward. But that he was still concerned. Concerned that he'd find nothing and that we'd put her through an operation for no reason. But he was feeling pressure from everyone, including Addie, to do something more than waiting. It was a go. We were moving forward. Right then. Two consent forms and a transport isolette later, she was on her way to the OR. As we walked the back halls with the team, I started to ask myself what I had just done. Had I gone too far? I have zero medical experience and here I am, trying to tell the doctors how to do their job. If I was wrong, and there was nothing evident when they went in, it would mean unnecessary pain. It would mean the wrong solution. It would mean weeks of extra recovery time. I doubted myself. My actions. My thoughts. My words. After we said goodbye, I spent the next 2 hours wondering if I'd made a terrible mistake. It felt like an eternity. I felt like a terrible father. Why had I insisted on this? Why didn't I trust the doctors and their schooling? They were all on the fence. Why wasn't I? It was agonizing. Then they finished. And the surgical team came and met us in the Blue Room while the nurses settled Addie back into her isolette. They'd found it. A stricture between her small and large intestine. An area that was so constricted that he said you couldn't fit the clicker-end of a pen through it. He said at first, he didn't see anything. Then as he examined it further, he knew this was it. He was confident. He squeezed what was backed up behind it and nothing came through. So he cut through it. Made it wider. And stitched it back up again. He didn't have to remove part of her colon. It just needed to be refactored to work again. The tissue at the site was a different color and consistency. This was it. The result of whatever she had at 3 weeks. Scarring from her first round of gut issues. None of them were sure just how she'd been able to pass anything. It was right at the point where the two GI studies both stopped showing anything. Right at the intersection. Too far for either of them to show clearly without an operation. Relief. It was the right decision. The fight we put up had been worth it. It was the right decision. And now, she's sleeping peacefully. On pain meds and the vent until she's had some time to heal enough to be her normal self. And now we can start looking forward. Knowing that we found the cause of her issues over the last 2 months. Knowing that we won't need to pause while she recovers from her feeds. Knowing that we can finally start to look towards the end of this thing. We can see the light at the end of the tunnel now. The tunnel that was blocked by a stricture. So small that no light got through. They've opened it up for us and we're not looking back.